Two young men with too much time on their hands have been fined for "correcting" an historic sign at the Grand Canyon. The fiberboard sign has yellow lettering with a black background. Deck [one of the two] wrote that they used a marker to cover an erroneous apostrophe, put the apostrophe in its proper place with white-out and added a comma. The two scamps were fined $3,035 to cover the costs of repairing the sign, and are on a year's probation during which time they are banned from public parks and enjoined from making any more corrections. A reporter has delighted in pointing out that a sentence now appearing on a website owned by the obsessive twosome-- "Statement on the signage of our National Parks and public lands to come" has omitted a full stop. It's probably a good thing you guys didn't get prison time for defacing a sign at a national park. An inmate would probably tattoo your forehead and misspell "@$%^%". It's an interesting clash and amalgam of rule-systems. 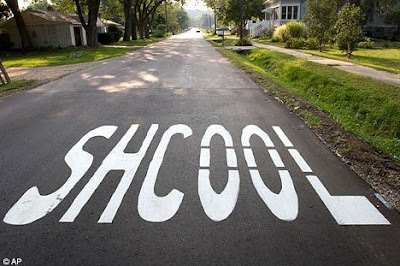 We have spelling and punctuation on one hand, the most superficial level of language here fetishized by two latter-day schoolmarms, and stern state enforcement of speling and punchuation on the other. Where to turn? Coments welcom. This page contains a single entry by Dr. Dawg published on August 26, 2008 9:03 AM. Borders was the previous entry in this blog. Borders, again: fun with FIDO is the next entry in this blog.